With one week of baseball in the books, several teams return home this week for the first time this week to open their respective ballparks for the 2016 season. Among those teams are the Los Angeles Dodgers, Chicago Cubs, Houston Astros and St. Louis Cardinals, who make up four of this week's most expensive MLB games. The Dodgers will open Dodger Stadium on Tuesday afternoon when they host the Arizona Diamondbacks. It will be the most expensive game of the week, with Los Angeles Dodgers tickets on the secondary market averaging $192.47 and the get-in price starting from $74. Kenta Maeda will take the mound against the Diamondbacks' Patrick Corbin. Dodgers fans will have to wait to welcome back Zack Greinke, however, who isn't scheduled to start over the three-game series. The American League Wild Card-winning Houston Astros return to Minute Maid Park to host the World Series champion Kansas City Royals Monday night. Collin McHugh will get the start for the Astros against Chris Young. 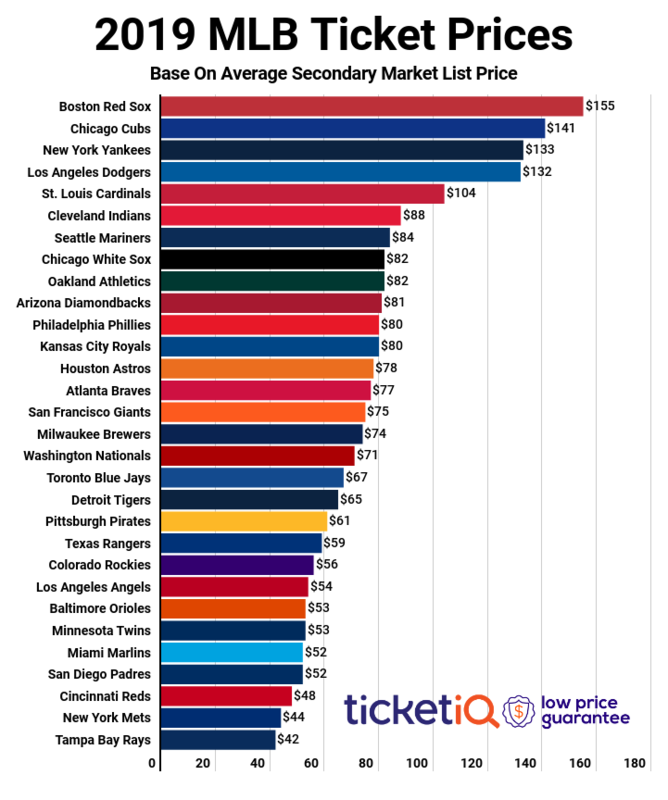 Houston Astros tickets against the Royals currently average $180.08 on the secondary market, making it the second most expensive game this week. If looking just to get in the cheapest ticket starts from $57. It was an active winter on the North Side of Chicago, where the Cubs were able to lure free agents Ben Zobrist, John Lackey and Jason Heyward into the Friendly Confines on multiple-year deals. The Cubs are heavily favorited to make a deep postseason run this October, albeit without rising star Kyle Schwarber, who will miss the rest of the season with full tears to the ACL and LCL in his left knee. They'll take on the Cincinnati Reds at Wrigley Field Monday night, where the average price for Chicago Cubs tickets on the resale market is $148.90. The cheapest ticket to the Cubs' home opener is $68. Jon Lester gets the nod for the Cubs against Reds pitcher Brandon Finnegan. The Cardinals would like to forget their NLDS sweeping at the hands of the Cubs, and they'll open Busch Stadium on Monday night against the Milwaukee Brewers. The average resale price for St. Louis Cardinals tickets against the Brewers is now $117.16 and the get-in price starts from $53. Michael Wacha will take the hill in search of his first win of the season against the Brewers' Taylor Jungmann. The Dodgers will open things up in Los Angeles against the Diamondbacks on Monday night, but perhaps the most intriguing matchup of the week comes on Friday night against the Giants. Clayton Kershaw will face fellow southpaw ace Madison Bumgarner at Dodger Stadium, which is currently the fifth most expensive game of the week. Dodgers vs Giants tickets for the opening game of the series on Friday now average $101.85 and the get-in price is $43 on the secondary market. In honor of the league-wide remembrance of Jackie Robinson each April 15, fans in attendance will receive a replica Jackie Robinson Dodgers jersey.